I’ve been a frequent user of the original Ranking Manager 1.0 for over 5 years and, long ago, found Web Position Gold wasn’t really that useful for me in my Search and Web Analytics work – nor were the other Ranking products available much better. A problem of all the Search Engine Ranking Platforms a few years ago was the lack of Unicode Support and software that violated Google’s and other search engines’ Terms of Service. When WPG was bought by WebTrends a while back, it was thought that WebTrends would improve the software – but they made only cosmetic changes and there’s actually less out there now to run your ranking reports well than before – and most choices were not that appealing, to be honest with you. 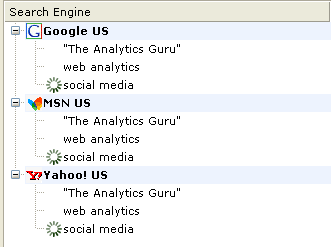 However, with Ranking Manager 6.0 a few references to it on http://www.Websitemanagementtools.com, including the audiovisual section – though Ranking Manager 6.0 and Website Manager are essentially the same tool – which some recent changes keep more to the original Ranking Manager 1.0 (now 1.1) navigation and flow. Next you create the keywords your going to use – and you can put them in buckets – something that no other platform can do – why? Ranking Manager 6.0 is a full relational database – so you can actually query it in MySql if you wanted to – and you can add more sites later and still get a historical ranking report on them … something you can’t do in Web Position or Agent Web Ranking, or any other product I’m aware of. I added a few keywords to just to show you what Ranking Manager operates – your can run these buckets as individual jobs or all at once, as part of the library – which is the sum of all the keywords (or urls, if we’re in the url section). And then you runurlur first queries – which are actually SQL queries run for you by Ranking Manager – queries you can manipulate if you want to. You can then customize reports and there’s a quite a few reports that Ranking Manager 6 comes with – much more than any other Ranking Platform I’ve seen – and many of these are customizable. There’s a lot more to Ranking Manager 6.0 but I wanted to let readers know that if you need to buy Ranking Software, Ranking Manager 6.0 is the best and I suggest buying it.